Oh. My. Days. I'm all over this. Imagine, if you will, the lyrical sass of Lady Sovereign (and the accent), the quirky production of Lily Allen, the cartoonish in-your-face bravado of the Spice Girls, a nice round harmony a la En Vogue and the soulful pipes of Aretha Franklin, mashed together for the year 2012 in a package of three live-out-loud Brit females. Then stop imagining. Stooshe, a trio signed to Warner UK, are currently touting around their second official single, "Love Me" (the original explicit version being, of course, "F*ck Me" -- but the redub does the same job without the expletives just fine), featuring the surprisingly ubiquitous (in the UK at least) Travie McCoy of Gym Class Heroes fame, and it is a wallop of a pop song indeed. All bright colors and open-mouthed confidence, Alexandra, Courtney and Karis vamp it up in a 2012 fusion of pinup allure, telling a prospective lad to cut to the chase and hurry the (expletive) up already. The general aesthetic of the video is slightly reminiscent to the charmingly weird ways of Aqua, Deee-Lite or say the Scissor Sisters even, but with a decidedly Motown-esque twist. It's kitsch to the millionth degree, but the impish ridiculousness and blatant raunch is balanced out but these chicks serious vocals. Part of Stooshe's charm is they don't mind looking ridiculous -- to them it's all about having a good time. If you like what you hear, check out their "other" single in the slightly more serious, but still very street slang savvy in "Betty Woz Gone". (How I long to have this type of Brit Accent, you just don't even know.) 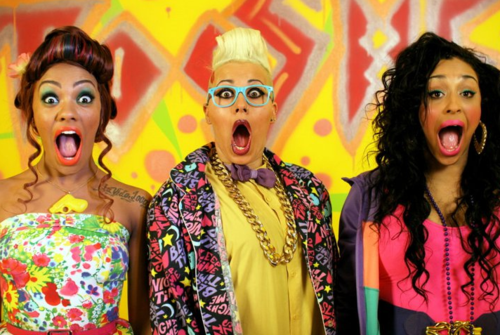 Stooshe's official debut record, Sticks & Roundabouts, is due for release in mid 2012.